Mice transgenic for human Ig loci are an invaluable resource for the production of human Abs. However, such mice often do not yield human mAbs as effectively as conventional mice yield mouse mAbs. Suboptimal efficacy in delivery of human Abs might reflect imperfect interaction between the human membrane IgH chains and the mouse cellular signaling machinery. To obviate this problem, in this study we generated a humanized rat strain (OmniRat) carrying a chimeric human/rat IgH locus (comprising 22 human VHs, all human D and JH segments in natural configuration linked to the rat CH locus) together with fully human IgL loci (12 Vκs linked to Jκ-Cκ and 16 Vλs linked to Jλ-Cλ). The endogenous Ig loci were silenced using designer zinc finger nucleases. Breeding to homozygosity resulted in a novel transgenic rat line exclusively producing chimeric Abs with human idiotypes. B cell recovery was indistinguishable from wild-type animals, and human V(D)J transcripts were highly diverse. Following immunization, the OmniRat strain performed as efficiently as did normal rats in yielding high-affinity serum IgG. mAbs, comprising fully human variable regions with subnanomolar Ag affinity and carrying extensive somatic mutations, are readily obtainable, similarly to conventional mAbs from normal rats. Human mAbs account for an increasing proportion of new drugs (1, 2). There have been major recent improvements in the way in which genetic information to encode Ag-specific mAbs can be obtained directly from human B cells (3–5). However, such approaches are largely restricted to Ags such as infectious agents where individuals mounting a specific immune response can be identified and provide a source of Ag-specific B cells. For other Ags, approaches have been developed that either involve individual humanization of Ag-specific rodent Abs (which needs to be carried out on a case-by-case basis) or involve the selection of Ag-specific binders from human Ab repertoires performed outside the human body. The individual humanization of rodent mAbs is laborious because it needs to be carried out on a case-by-case basis with the V region sequence being manipulated (as well as the C region exchanged) to minimize immunogenicity (6–8). The alternative strategy of obtaining Ag-specific human Abs by use of selections performed outside the human body typically employs either in vitro selection technologies (e.g., phage display) or in vivo Ag-mediated selection (i.e., immunization) in genetically engineered animals that express human Ab repertoires (9–14). Thus, following immunization, Ag-specific human mAbs can be obtained by conventional hybridoma technology from transgenic mice whose B cell populations express human Ab repertoires. Indeed, in light of the potential importance of human mAbs as therapeutics, much effort has been devoted to creating improved mouse strains from which human mAbs can be more readily elicited ever since the first description of a mouse strain carrying an artificially constructed rearranging human IgH minilocus (15). In most of the published mouse strains currently under use, segments of the human IgH and IgL loci comprising differing numbers of human V, D, and J segments linked to human C regions have been integrated into the mouse germline (16, 17) with the endogenous mouse Ig loci having been rendered nonfunctional through targeted gene disruption (18). Many human mAbs have been generated from transgenic lines by this strategy with six of eight fully human mAbs approved by the U.S. Food and Drug Administration (panitumumab, ofatumumab, golimumab, denosumab, ustekinumab, ipilimumab) and with further such mAbs currently being tested in phase II or III trials (http://en.wikipedia.org/wiki/List_of_monoclonal_antibodies) (1). However, there is clearly room for improvement. Indeed, it has been suggested that suboptimal performance of these humanized mouse strains with regard to the efficacy with which they yield human mAbs might result from imperfect interaction between the C region of the human Ig expressed on the B cell membrane and the mouse cellular signaling machinery (19). Because the transgenic mice can essentially be viewed as a source of Ag-specific IgV genes (with the desired IgC region provided at a later stage during the creation of cell lines for bulk Ab production), we wondered whether the transgenic approach could be improved if the germline configuration human IgVH-D-JH segments were linked to endogenous (rather than human) IgCH regions. In this study, we describe a rat strain carrying entirely human IgL transloci but with an IgH translocus in which human IgVH, D, and JH segments have been linked to germline-configured rat IgCH regions. We find that this rat strain gives highly efficient chimeric Ab expression with serum IgM and IgG levels similar to those obtained with normal rats. Large numbers of high-affinity chimeric mAbs can also be readily established from these animals. The human IgH V genes were covered by two bacterial artificial chromosomes (BACs): BAC6-VH3-11 containing the authentic region spanning from VH4-39 to VH3-23 followed by VH3-11 (modified from a commercially available BAC clone 3054M17 CITB) and BAC3 containing the authentic region spanning from VH3-11 to VH6-1 (811L16 RPCI-11). A BAC termed Annabel was constructed by joining rat CH region genes immediately downstream of the human VH6-1-Ds-JHs region (Fig. 1A). All BAC clones containing part of the human or rat IgH locus were purchased from Invitrogen. Oligonucleotides and PCR conditions are listed in the Supplemental Material. Integrated human Ig loci. (A) The chimeric human/rat IgH region contains three overlapping BACs with 22 different and potentially functional human VH segments. BAC6-3 has been extended with VH3-11 to provide a 10.6-kb overlap to BAC3, which overlaps 11.3 kb via VH6-1 with the C region BAC human/rat Annabel. The latter is chimeric and contains all human D and JH segments followed by the rat C region (Cμ, Cγ1, Cγ2b, Cε, Cα) with full enhancer sequences. (B) The human Igκ BACs with 12 Vκs and all Jκs provide an ∼14-kb overlap in the Vκ region and ∼40 kb in Cκ to include the KDE. (C) The human Igλ region with 17 Vλs and all J-Cλs, including the 3′ enhancer, is from a YAC (24). Both BAC6-VH3-11 and Annabel were initially constructed in Saccharomyces cerevisiae as circular yeast artificial chromosome (cYACs) and further checked and maintained in Escherichia coli as BACs. Unlike YACs, BAC plasmid preps yield large quantities of the desired DNA. To convert a linear YAC into a cYAC or to assemble DNA fragments with overlapping ends into a single cYAC in S. cerevisiae, which can also be maintained as a BAC in E. coli, two self-replicating S. cerevisiae/E. coli shuttle vectors, pBelo-CEN-URA and pBelo-CEN-HYG, were constructed. Briefly, S. cerevisiae CEN4 was cut out as an AvrII fragment from pYAC-RC (20) and ligated to SpeI- linearized pAP599 (21). The resulting plasmid contains CEN4 cloned in between S. cerevisiae URA3 and a hygromycin-resistance expression cassette (HygR). From this plasmid, an ApaLI-BamHI fragment containing URA3 followed by CEN4 or a PmlI–SphI fragment containing CEN4 followed by HygR was cut out and ligated to ApaLI and BamHI or HpaI and SphI doubly digested pBACBelo11 (New England BioLabs) to yield pBelo-CEN-URA and pBelo-CEN-HYG. To construct BAC6-VH3-11, initially two fragments, a 115-kb NotI-PmeI and a 110-kb RsrII-SgrAI, were cut out from the BAC clone 3054M17 CITB. The 3′ end of the former fragment overlaps 22 kb with the 5′ end of the latter. The NotI-PmeI fragment was ligated to a NotI-BamHI YAC arm containing S. cerevisiae CEN4 as well as TRP1/ARS1 from pYAC-RC, and the RsrII-SgrAI fragment was ligated to an SgrAI-BamHI YAC arm containing S. cerevisiae URA3, also from pYAC-RC. Subsequently, the ligation mixture was transformed into S. cerevisiae AB1380 cells via spheroplast transformation (22), and URA+TRP+ yeast clones were selected. Clones, termed YAC6, containing the linear region from human VH4-39 to VH3-23 were confirmed by Southern blot analysis. YAC6 was further extended by addition of a 10.6-kb fragment 3′ of VH3-23 and conversion to a cYAC. The 10.6-kb extension contains the human VH3-11 and also occurs at the 5′ end of BAC3. We constructed pBeloHYG-YAC6+BAC3(5′) for the modification of YAC6. Briefly, three fragments with overlapping ends were prepared by PCR: 1) a “stuff” fragment containing S. cerevisiae TRP1-ARS1 flanked by HpaI sites with a 5′ tail matching the sequence upstream of VH4-39 and a 3′ tail matching downstream of VH3-23 in YAC6 (using long oligonucleotides 561 and 562, and pYAC-RC as template); 2) the 10.6-kb extension fragment with a 5′ tail matching the sequence downstream of VH3-23 as described above and a unique AscI site at its 3′ end (using long oligonucleotides 570 and 412, and human genomic DNA as template); and 3) pBelo-CEN-HYG vector with the CEN4 joined downstream with a homology tail matching the 3′ end of the 10.6 extension fragment and the HygR joined upstream with a tail matching the sequence upstream of VH4-39 as described above (using long oligonucleotides 414 and 566, and pBelo-CEN-HYG as template). Subsequently, the three PCR fragments were assembled into a small cYAC conferring HYGR and TRP+ in S. cerevisiae via homologous recombination associated with spheroplast transformation, and this cYAC was further converted into the BAC pBeloHYG-YAC6+BAC3(5′). Finally, the HpaI-digested pBeloHYG-YAC6+BAC3(5′) was used to transform yeast cells carrying YAC6, and through homologous recombination cYAC BAC6-VH3-11 conferring only HYGR was generated. Via transformation (see below) this cYAC was introduced as a BAC in E. coli. 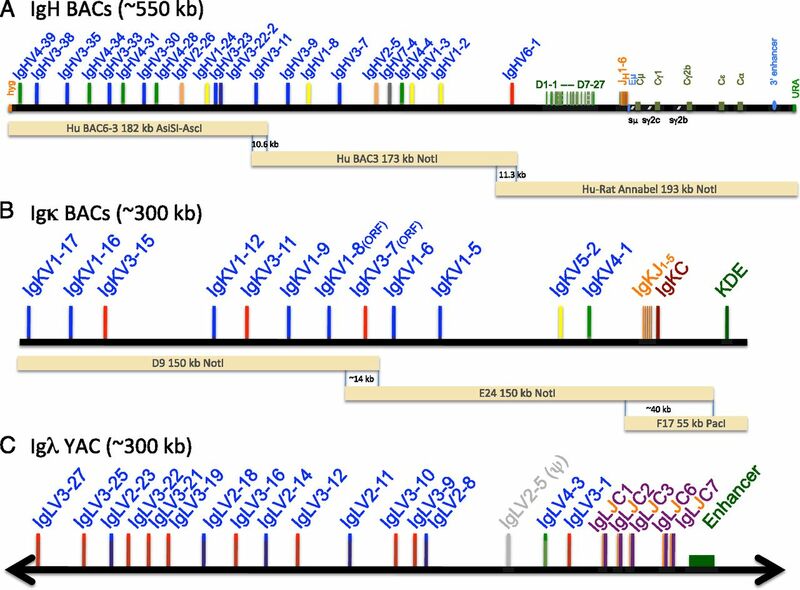 The human VH genes in BAC6-VH3-11 were cut out as an ∼182-kb AsiSI (occurring naturally in the HygR)-AscI fragment, and the VH genes in BAC3 were cut out as an ∼173-kb NotI fragment (Fig. 1A). For the assembly of the C region with the VH overlap, the human VH6-1-Ds-JHs region had to be joined with the rat genomic sequence immediately downstream of the last JH followed by rat Cs to yield a cYAC/BAC. To achieve this, five overlapping restriction as well as PCR fragments were prepared: a 6.1-kb fragment 5′ of human VH6-1 (using oligonucleotides 383 and 384, and human genomic DNA as template), an ∼78-kb PvuI-PacI fragment containing the human VH6-1-Ds-JHs region cut out from BAC1 (RP11645E6), a 8.7-kb fragment joining the human JH6 with the rat genomic sequence immediately downstream of the last JH and containing part of rat μ coding sequence (using oligonucleotides 488 and 346, and rat genomic DNA as template), an ∼52-kb NotI-PmeI fragment containing the authentic rat μ, δ, and γ2c region cut out from BAC M5 (CH230-408M5) and the pBelo-CEN-URA vector with the URA3 joined downstream with a homology tail matching the 3′ end of the rat γ2c region and the CEN4 joined upstream with a tail matching the 5′ region of human VH6-1 as described (using long oligonucleotides 385 and 550, and pBelo-CEN-URA as template). Correct assembly via homologous recombination in S. cerevisiae was analyzed by PCR and purified cYAC from the correct clones was converted into a BAC in E. coli. For the assembly of Annabel, parts of the above cYAC/BAC containing humanVH6-1-Ds-JHs followed by the authentic rat μ, δ, and γ2c region, as well as PCR fragments, were used. Five overlapping fragments contained the 6.1-kb fragment at the 5′ end of human VH6-1 as described above, an ∼83 kb SpeI fragment comprising human VH6-1-Ds-JHs immediately followed by the rat genomic sequence downstream of the last JH and containing part of rat Cμ, a 5.2-kb fragment joining the 3′ end of rat μ with the 5′ end of rat γ1 (using oligonucleotides 490 and 534, and rat genomic DNA as template), an ∼118-kb NotI-SgrAI fragment containing the authentic rat γ1, γ2b, ε, α, and 3′E IgH enhancer region cut out from BAC I8 (CH230-162I08), and the pBelo-CEN-URA vector with the URA3 joined downstream with a homology tail matching the 3′ end of rat 3′E and the CEN4 joined upstream with a tail matching the 5′ end of human VH6-1 as described above. There is a 10.3-kb overlap between the human VH6-1 regions in both the BAC3 and Annabel. The human VH6-1-Ds-JHs followed by the rat CH region together with the S. cerevisiae URA3 in Annabel can be cut out as a single ∼193-kb NotI fragment (see Fig. 1A). BAC6-VH3-11, BAC3, and Annabel were checked extensively by restriction analysis and partial sequencing for their authenticity. The human Igλ locus on an ∼410-kb YAC was obtained by recombination assembly of a Vλ YAC with 3 Cλ containing cosmids (23). Rearrangement and expression was verified in transgenic mice derived from ES cells containing one copy of a complete human Igλ YAC (24). This Igλ YAC was shortened by the generation of a cYAC removing ∼100 kb of the region 5′ of Vλ3-27. The vector pYAC-RC was digested with ClaI and BspEI to remove URA3 and ligated with a ClaI/NgoMIV fragment from pAP 599 containing HYG (Fig. 1C). PCR of the region containing the yeast centromere and hygromycin marker gene from the new vector (pYAC-RC-HYG) was carried out with primers with 5′ ends homologous to a region 5′ of Vλ3-27 (primer 276) and within the ADE2 marker gene in the YAC arm (primer 275). The PCR fragment (3.8 kb) was integrated into the Igλ YAC using a high-efficiency lithium acetate transformation method (25) and selection on hygromycin-containing yeast extract/peptone/dextrose plates. DNA was prepared from the clones (Epicentre MasterPure yeast DNA purification kit) and analyzed for the correct junctions by PCR using the following oligonucleotides: 243 plus 278 and Hyg end R plus 238. Plugs were made (26) and yeast chromosomes removed by pulsed field gel electrophoresis (PFGE; 0.8% agarose gel [pulse field certified; Bio-Rad) [6 V/cm, pulse times of 60 s for 10 h and 10 s for 10 h, 8°C), leaving the cYAC caught in the agarose block (27). The blocks were removed and digested with NruI. Briefly, blocks were preincubated with restriction enzyme buffer in excess at a 1× final concentration for 1 h on ice. Excess buffer was removed leaving just enough to cover the plugs, restriction enzyme was added to a final concentration of 100 U/ml, and the tube was incubated at 37°C for 4–5 h. The linearized YAC was run out of the blocks by PFGE, cut out from the gel as a strip, and purified as described below. For the human Igκ locus three BACs were chosen (RP11-344F17, RP11-1134E24, and RP11-156D9; Invitrogen), which covered a region over 300 kb from 5′ Vκ1-17 to 3′ KDE (28). In digests and sequence analyses three overlapping fragments were identified: from Vκ1-17 to Vκ3-7 (150-kb NotI with ∼14-kb overlap), from Vκ3-7 to 3′ of Cκ (158-kb NotI with ∼40-kb overlap), and from Cκ to 3′ of the KDE (55-kb PacI with 40-kb overlap) (Fig. 1B). Overlapping regions may generally favor joint integration when coinjected into oocytes (29). Purified YAC and BAC DNA were analyzed by restriction digest and separation on conventional 0.7% agarose gels (30). Larger fragments (50–200 kb) were separated by PFGE (Bio-Rad CHEF Mapper) at 8°C using 0.8% pulsed field–certified agarose in 0.5% TBE, at 2–20 s switch time for 16 h, 6 V/cm, 10 mA. Purification allowed a direct comparison of the resulting fragments with the predicted size obtained from the sequence analysis. Alterations were analyzed by PCR and sequencing. Linear YACs, cYACs, and BAC fragments after digests were purified by electroelution using Elutrap (Schleicher and Schuell) (31) from strips cut from 0.8% agarose gels run conventionally or from PFGE. The DNA concentration was usually several nanograms per microliter in a volume of ∼100 μl. For fragments up to ∼200 kb the DNA was precipitated and redissolved in microinjection buffer (10 mM Tris-HCl [pH 7.5], 100 mM EDTA [pH 8], and 100 mM NaCl but without spermine/spermidine) to the desired concentration. The purification of cYACs from yeast was carried out using NucleoBond AX silica-based anion-exchange resin (Macherey-Nagel, Düren, Germany). Briefly, spheroplasts were made using zymolyase or lyticase and pelleted (32). The cells then underwent alkaline lysis, binding to AX100 column and elution as described in the NucleoBond method for a low-copy plasmid. Contaminating yeast chromosomal DNA was hydolyzed using Plasmid-Safe ATP-dependent DNase (Epicentre Biotechnologies) followed by a final cleanup step using SureClean (Bioline). An aliquot of DH10 electrocompetent cells (Invitrogen) was then transformed with the cYAC to obtain BAC colonies. For microinjection, the insert DNA (150–200 kb) was separated from BAC vector DNA (∼10 kb) using a filtration step with Sepharose 4B-CL (33). Purified DNA encoding recombinant Ig loci was resuspended in microinjection buffer with 10 mM spermine and 10 mM spermidine. The DNA was injected into fertilized oocytes at various concentrations from 0.5 to 3 ng/μl. Plasmid DNA or mRNA encoding zinc finger nucleases (ZFNs) specific for rat Ig genes were injected into fertilized oocytes at various concentrations from 0.5 to 10 ng/μl. Microinjections were performed at the Caliper Life Sciences facility and Rat Transgenic Nantes facilities. Outbred SD/Hsd (wild-type [wt]) strain animals were housed in standard microisolator cages under approved animal care protocols in an animal facility that is accredited by the Association for the Assessment and Accreditation for Laboratory Animal Care. The rats were maintained on a 14–10 h light/dark cycle with ad libitum access to food and water. Four to 5-wk-old SD/Hsd female rats were injected with 20–25 IU pregnant mare serum gonadotropin (Sigma-Aldrich) followed 48 h later with 20–25 IU human chorionic gonadotropin (Sigma-Aldrich) before breeding to outbred SD/Hsd males. Fertilized single-cell stage embryos were collected for subsequent microinjection. Manipulated embryos were transferred to pseudopregnant SD/Hsd female rats to be carried to parturition. Multifeature human Ig rats (human IgH, Igκ, and Igλ in combination with rat J knockout (KO), κKO, and λKO) and wt, as control, were analyzed at 10–18 wk age. The animals were bred at Charles River under specific pathogen-free conditions. All animal procedures involving the care and use of OmniRat were in accordance with the guidelines set forth in the Guide for the Care and Use of Laboratory Animals (available at: http://grants.nih.gov/grants/olaw/Guide-for-the-Care-and-Use-of-Laboratory-Animals.pdf), which are adapted from the requirements of the Animal Welfare Act or regulations concerning the ethics of science research in the INSERM Unité Mixte de Recherche 1064 animal facility and approved by the regional ethics and veterinary commissions (no. F44011). Transgenic rats were identified by PCR from tail or ear clip DNA using an Isolate genomic DNA mini kit (Bioline). For IgH PCRs ≤1 kb GoTaq Green Master mix was used (Promega) following the general guidelines provided for this enzyme, with details given in Supplemental Table I. For IgH PCRs >1 kb KOD polymerase (Novagen) was used with standard cycling conditions but with an extension time of 90 s. The Igκ and Igλ PCR used Green Master mix as described above. RNA was extracted from blood using the RiboPure blood kit (Ambion) and from spleen, bone marrow, or lymph nodes used the RNAspin mini kit (GE Healthcare). cDNA was made using oligo(dT) and Promega reverse transcriptase at 42°C for 1 h. GAPDH PCR reactions (oligonucleotides 429–430) confirmed that RNA extraction and cDNA synthesis were successful. RT-PCRs were set up using VH leader primers with rat μCH2 or rat γCH2 primers (Supplemental Table I), and GoTaq Green Master mix PCR products of the expected size were either purified by gel or QuickClean (Bioline) and sequenced directly or cloned into pGem-T (Promega). IgM was purified on anti-IgM affinity matrix (CaptureSelect no. 2890.05; BAC, Naarden, The Netherlands,) as described in the protocol. Similarly, human Igκ and Igλ was purified on anti–L chain affinity matrix (CaptureSelect anti-Igκ no. 0833 and anti-Igλ no. 0849) according to the protocol. For rat IgG purification (34) protein A and protein G-agarose was used (Innova Biosciences, Cambridge, U.K., nos. 851-0024 and 895-0024). Serum was incubated with the resin and binding was facilitated at 0.1 M sodium phosphate pH 7 for protein G and pH 8 for protein A under gentle mixing. Poly-Prep columns (Bio-Rad) were packed with the mixture and washed extensively with PBS (pH 7.4). Elution buffer was 0.1 M sodium citrate (pH 2.5) and neutralization buffer was 1 M Tris-HCl (pH 9). Electrophoresis was performed on 4–15% SDS-PAGE and Coomassie brilliant blue was used for staining. Molecular mass standards were HyperPAGE prestained protein marker (BIO-33066; Bioline). Cell suspensions were washed and adjusted to 5 × 105 cells/100 μl in PBS/1% BSA/0.1% sodium azide. Different B cell subsets were identified using mouse anti–rat IgM FITC-labeled mAb (MARM4; Jackson ImmunoResearch Laboratories) in combination with anti–B cell CD45R (rat B220) PE-conjugated mAb (His24; BD Biosciences). A FACSCanto II flow cytometer and FlowJo software (Becton Dickinson, Pont de Claix, France) were used for the analysis (35). Fluorescence in situ hybridization was carried out on fixed blood lymphocytes using purified IgH and IgL C region BAC (36). Immunizations were performed with 125 μg progranulin (PGRN) in CFA, 150 μg human growth hormone receptor (hGHR) in CFA, 200 μg TAU/keyhole limpet hemocyanin (KLH) in CFA, 150 μg hen egg lysozyme (HEL) in CFA, and 150 μg OVA in CFA at the base of the tail and medial iliac lymph node cells were fused with mouse P3X63Ag8.653 myeloma cells 22 d later as described (37). For multiple immunizations, protein, 125 μg PGRN or hen egg lysozyme, or 100 μg human growth hormone receptor or CD14 in GERBU adjuvant (http://www.Gerbu.com) were administered i.p. as follows: days 0, 14, 28, and day 41 without adjuvant, followed by spleen cell fusion with P3X63Ag8.653 cells 4 d later (3). Binding kinetics were analyzed by surface plasmon resonance using a Biacore 2000 with the Ags directly immobilized as described (19). Construction of the human Ig loci employed established technologies to assemble large DNA segments using YACs and BACs (23, 29, 38–40). As multiple sequential BAC modifications in E. coli frequently led to the deletion from the BAC of repetitive regions such as Ig switch sequences or of elements in the vicinity of the IgH 3′ enhancers, a strategy was developed to assemble these large transloci by homologous recombination in S. cerevisiae as cYAC and, subsequently, converting such a cYAC into a BAC. The advantages of YACs include their large size, their sequence stability, and the ease of homologous alterations in the yeast host. BACs propagated in E. coli offer the advantages of easy preparation and large yield. Furthermore, detailed restriction mapping and sequencing analysis can be better achieved in BACs than in YACs. The structures of the assembled chimeric IgH (human VH, D, and JH segments followed by rat C genes) and human Igκ BACs as well as of the human Igλ YAC are depicted in Fig. 1. The integrated IgH and IgL transloci were then generated by coinjecting multiple BACs into fertilized rat oocytes, exploiting the previous finding that coinjection of overlapping DNA constructs often leads to cointegration into the genome (29). Thus, the IgH translocus was created by coinsertion of BAC6-VH3-11 (a 182-kb AsiSI-AscI fragment containing 13 VHs) with BAC3 (a 173-kb NotI fragment containing 10 VHs) and BAC3-1N12M5I8 (human/rat Annabel, a 193-kb NotI fragment containing human VH6-1 and all Ds and JHs followed by the rat C region). This resulted in the reconstitution of a fully functional IgH locus in the rat genome. Similarly, the human Igκ locus was integrated by homologous overlaps (D9 containing Vκ genes, a 150-kb NotI fragment; E24, containing Vκs, Jκs, and Cκ on a 150-kb NotI fragment; and F17, a 40-kb PacI fragment containing Jκs, Cκ, and the KDE). The human Igλ locus was isolated intact as an ∼300-kb YAC and also fully inserted into a rat chromosome. The integration success was identified in several founders each by transcript analysis that showed V(D)J-C recombinations from the most 5′ to the most 3′ end of the locus injected. Multiple BAC insertions were identified by quantitative PCR using VH- and CH-specific oligonucleotides (not shown) and it is likely that head-to-tail integrations occurred. In all cases, transgenic animals with single-site integrations were generated by breeding. The derivation of the transgenic rats by DNA microinjection into oocytes, as well as their breeding and immunization, were carried out by a strategy similar to that previously used with the humanized mice (15, 16, 41). However, a different approach was needed to achieve inactivation of the endogenous rat Ig loci because targeted gene inactivation in embryonic stem cells is not a technology that has been developed in the rat. We therefore used ZFN technology, an approach that has only been reported recently (42, 43), to obtain rat lines with targeted inactivation of their IgH, Igκ, and Igλ loci (the inactivation of the rat IgH locus was described in Ref. 35, and a manuscript describing inactivation of rat Igκ and Igλ is in preparation [by M.J. Osborn, S. Avis, R. Buelow, and M. Brüggemann]). Analysis of the translocus integration by PCR as well as by fluorescence in situ hybridization (FISH) (Table I) revealed integration of all injected BACs in completion. Several founder rats carried low translocus copy numbers, with the rat C gene BAC in OmniRat likely to be fully integrated in five copies as determined by quantitative PCR of Cμ and Cα products (not shown). Identification by FISH of single position insertion in many lines confirmed that multiple integration of BAC mixtures into different rat chromosomes was rare. Rats carrying the individual human transloci (IgH, Igκ, and Igλ) were crossbred successfully to homozygosity with Ig locus KO rats. This produced a highly efficient new multifeature line (OmniRat) with human VH-D-JH regions of >400 kb containing 22 functional VHs and a rat C region of ∼116 kb. Flow cytometric analyses were performed to assess whether the introduced human Ig loci were capable of reconstituting normal B cell development. Particular differentiation stages were analyzed in spleen and bone marrow lymphocytes (Fig. 2), which previously showed a lack of B cell development in JKO/JKO rats (35), as well as no respective IgL expression in κKO/κKO and λKO/λKO animals (data not shown). Most striking was the complete recovery of B cell development in OmniRat compared with wt animals, with similar numbers of B220(CD45R)+ lymphocytes in bone marrow and spleen. IgM expression in a large proportion of CD45R+ B cells marked a fully reconstituted immune system. Separation of spleen cells was indistinguishable between OmniRat and wt animals and thus was successfully restored in the transgenic rats expressing human idiotypes with rat C region. Moreover, a small population of surface IgG+ spleen lymphocytes was present in OmniRat (Fig. 2, right). 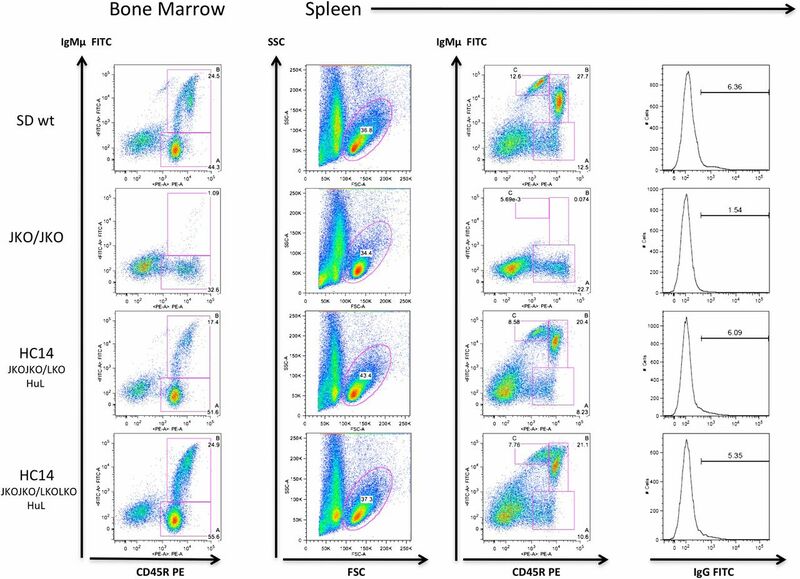 Flow cytometry analysis of lymphocyte-gated bone marrow and spleen cells from 3-mo-old rats. Surface staining for IgM and CD45R (B220) revealed a similar number of immature and mature B cells in bone marrow and spleen of OmniRat (HC14 JKOJKO/LKOLKO HuL) and wt animals, whereas JKO/JKO animals showed no B cell development. Plotting forward scatter (FSC) against side scatter (SSC) showed comparable numbers of lymphocyte (gated) populations, concerning size and shape. Surface staining of spleen cells with anti-IgG (G1, G2a, G2b, G2c isotype) revealed near normal frequency of IgG+ expressers in OmniRat animals compared with wt. In bone marrow: A, pro/pre–B cells (CD45R+IgM−); B, immature B cells (CD45R+IgM+). In spleen: A, lymphocyte precursors (CD45R+IgM−); B, follicular B cells (CD45R+IgM+); C, marginal zone B cells (CD45RlowIgM+). Other lymphoid populations (as judged by flow cytometric staining for CD3, CD4, and CD8) were unaltered in OmniRat as compared with control animals (data not shown), which further supports the notion that optimal immune function has been completely restored. Analysis of Ig V, D, and J gene usage by RT-PCR of transcripts present in splenic or PBLs revealed that all of the human VH and VL genes present in the Ig transloci in OmniRat and regarded as functional (44) were used (Table II). Human VH genes were associated with diverse human D and JH segments linked to both rat Cμ and Cγ. Similarly, RT-PCR analysis of L chain transcripts showed extensive use and diversity. The analysis of class switch and hypermutation (Fig. 3) showed that both of these processes are operating effectively on the OmniRat IgH locus. Amplification of IgG switch products from PBLs revealed an extensive rate of mutation (>2 aa changes) in most cells (∼80%) and in near equal numbers of γ1 and γ2b H chains. A small percentage of trans-switch sequences, γ2a and 2c, were also identified, which supports the observation that the translocus is similarly active, but providing human (VH-D-JH)s, as the endogenous IgH locus (45). The number of mutated human Igλ and Igκ L chain sequences is ∼30% and thus appears to be less pronounced than what has been found for IgG H chains. The reason is that L chain RT-PCR products are amplified from both IgM, which is less mutated, and IgG-producing cells rather than from IgG+ or differentiated plasma cells. Mutational changes in IgH and IgL transcripts from PBLs. Germline Vs are listed on the horizontal axes and amino acid changes on the vertical axes. Unique (VHDJH)s and VLs were from amplifications with V group–specific primers: IGHV1, 2, 3, 4, and 6 in combination with the universal γCH2 reverse primer; IGLV2, 3, and 4 with reverse Cλ primer; and IGKV1, 3, 4, and 5 in with reverse Cκ primer (Supplemental Table I). Mutated trans-switch products were identified for human VH-rat Cγ2a (4) and human VH-rat Cγ2c (2). To gain unambiguous information about Ab production we compared quality and quantity of serum Ig from ∼3-mo-old OmniRat and normal wt animals housed in pathogen-free facilities. Purification of IgM and IgG separated on SDS-PAGE under reducing conditions (Fig. 4) showed the expected size, that is, ∼75 kDa for μ, ∼55 kDa for γ H chains, and ∼25 kDa for L chains, and was indistinguishable between OmniRat and wt animals. The yield of Ig from serum was found in both OmniRat and wt animals to be 100–300 μg/ml for IgM and 1–3 mg/ml for IgG. However, as rat IgG purification on protein A or G is seen as suboptimal (34), rat Ig levels may be underrepresented. The results from these naive animals compares well with the IgM levels of 0.5–1 mg/ml and IgG levels of several milligrams per milliliter reported for rats kept in open facilities (46, 47). Interestingly, we were able to visualize class-specific mobility of rat IgG isotypes on SDS-PAGE (34) with a distinct lower size band for γ2a H chains (Fig. 4B). This band is missing in OmniRat owing to the lack of Cγ2a in the translocus. However, because the IgG levels were similar between OmniRat and wt animals, we assume class switching is similarly efficient, albeit using different C genes. Purification of human Igκ and Igλ by capturing with anti–L chain was also successful (Fig. 4C, 4D) with H and L chain bands of the expected size. Confirmation of the IgM/G titers was also obtained by ELISA, which determined wt and OmniRat isotype distribution and identified comparable amounts of IgG1 and IgG2b (not shown). Purification of rat Ig with human idiotypes and comparison with human and normal rat Ig levels. OmniRat serum and human or rat wt control serum, 100 μl each, was used for IgM/G purification. (A) IgM was captured with anti-IgM matrix, which identified 14 μg in wt rat and 30 and 10 μg in OmniRat animals (HC14(a) and HC14(b)). (B) IgG was purified on protein A and protein G columns, with a yield of up to ∼3 mg/ml for OmniRat (protein A: HC14(a), 1000 μg/ml; HC14(b), 350 μg/ml; wt rat, 350 μg/ml; protein G: HC14(a), 2970 μg/ml; HC14(b), 280 μg/ml; wt rat, 1010 μg/ml). (C) Human Igκ and (D) human Igλ was purified on anti-Igκ and anti-Igλ matrix, respectively. No purification product was obtained using wt rat serum (not shown). Purified Ig, ∼3 μg (concentration determined by NanoDrop), was separated on 4–15% SDS-PAGE under reducing conditions. Comparison by ELISA titration of (E) human Igκ and (F) human Igλ levels in individual OmniRat animals (8531, 8322, 8199, 8486, 8055), human, and wt rat serum. Serum dilution (1:10, 1:100, 1:1,000, 1:10,000) was plotted against binding measured by adsorption at 492 nm. Matching name/numbers refer to samples from the same rat. A direct comparison of human Ig L chain titers in solid phase titrations (Fig. 4E, 4F) revealed 5- to 10-fold lower levels in OmniRat animals than in human serum. However, this was expected, as human control serum from mature adults can sometimes contain >10-fold higher Ig levels than in children up to their teens (48), which would be similar to the human Igκ and Igλ titers in young rats. Although wt rats produce very little endogenous Igλ, transgenic rats can efficiently express both types of human L chain, Igκ and Igλ. Several cell fusions were carried out using either a rapid one immunization scheme and harvesting lymph nodes or, alternatively, using booster immunizations and spleen cells (Table III, Table IV). For example, a considerable number of stable hybridomas were obtained after one immunization with human PGRN and myeloma fusion 22 d later. In this study, cell growth was observed in ∼3520 and ∼1600 wells in SD control and OmniRat hybridoma clones, respectively. Anti–PGRN-specific IgG, characterized by biosensor measurements, was produced by 148 OmniRat clones. Limiting dilution, to exclude mixed wells, and repeat affinity measurements revealed that OmniRat clones retain their Ag specificity. 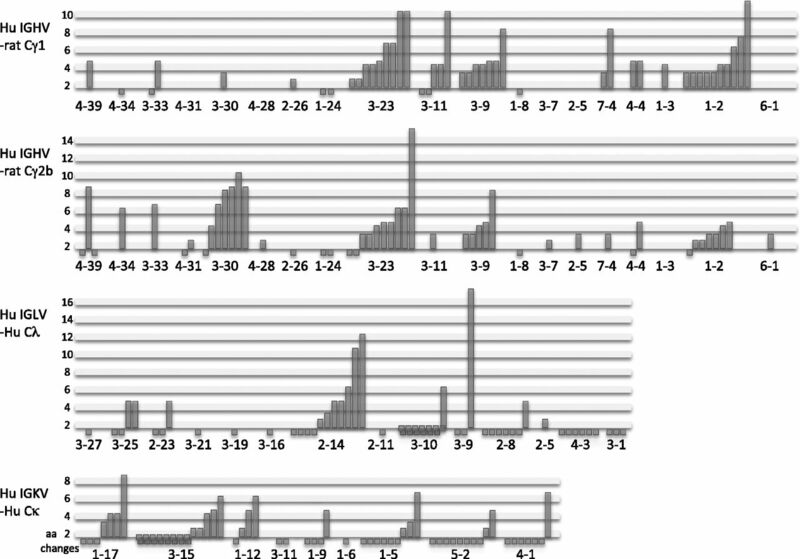 A comparison of association and dissociation rates of Abs from SD and OmniRat clones showed similar affinities between 0.3 and 74 nM (Tables III, IV, and data not shown). Single immunizations with hGHR, TAU receptor coupled to KLH (TAU/KLH), HEL, or OVA, followed by lymph node fusions, also produced many high-affinity human Abs often at similar numbers compared with wt. Furthermore, conventional booster immunizations with human PGRN, hGHR, human CD14, and HEL resulted in high affinities (picomolar range) of IgG with human idiotypes. OmniRat animals always showed the expected 4- to 5-log titer increase of Ag-specific serum IgG, similar to and as pronounced as wt rats (Table III). Although the results could vary from animal to animal, comparable numbers of hybridomas producing Ag-specific Abs with similarly high affinities were obtained from wt animals (SD and other strains) and the OmniRat strain. A summary of individual IgG-producing lymph node and spleen cell fusion clones, showing their diverse human VH-D-JH, human Vκ-Jκ, or Vλ-Jλ characteristics and affinities, are presented in Table IV. The immunization and fusion results showed that affinities well <1 nM (determined by biosensor analysis) were frequently obtained from OmniRat animals immunized with PGRN, CD14, TAU, HEL, and OVA Ags. In summary, Ag-specific hybridomas from OmniRats could be as easily generated as from wt animals yielding numerous mAbs with subnanomolar affinity even after a single immunization. Assembling a novel IgH locus comprising human VH, D, and JH gene segments linked to a large part of the rat CH region has resulted in a highly efficient and near-normal expression level of Abs with human idiotypes. 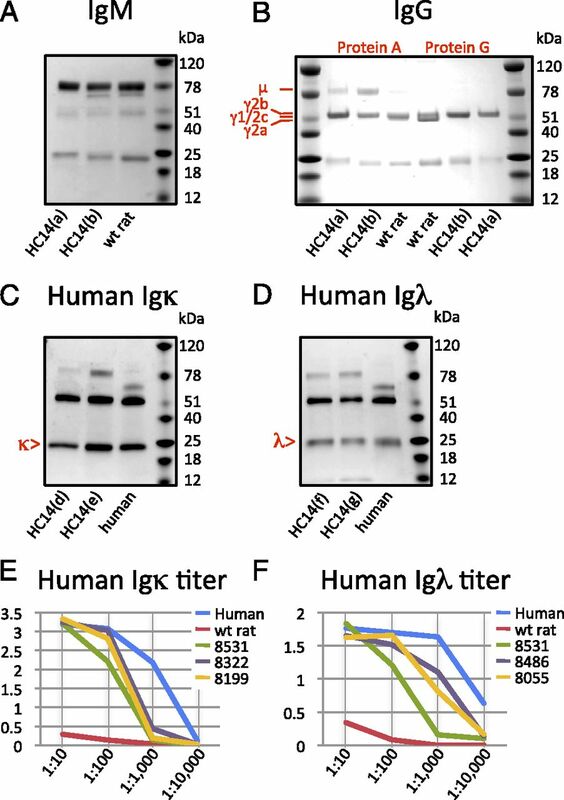 The combination of this chimeric IgH locus with human Igκ and Igλ loci has further revealed that chimeric Ab with fully human specificity is readily produced by the rats and that these chimeric IgH chains associate well with human IgL chains. The excellent performance of these transgenic Ig loci with respect to the reconstitution of B cell development, the high titers of serum Ig, and the efficacy with which high-affinity Abs are obtained most probably derives from the fact that the C region of the IgH tranlocus is of endogenous (rat) origin. This could be reflected in several aspects of its performance. The quality of an immune response is known to rely on the combined actions of many signaling and modifier components associated with the B cell Ag receptor (see: http://www.biocarta.com/pathfiles/h_bcrpathway.asp). The use of rat IgH C regions should ensure efficient physiological interaction of the translocus-encoded membrane Ig with those endogenous components of the B cell Ag receptor (CD79A and CD79B) and other host Ag receptor-associated molecules that are necessary for efficient B cell activation. The use of rat IgH C regions will also allow physiological interaction with the various host Fc receptors implicated in immune response regulation (49, 50). However, a distinct attraction of using an IgH translocus in which the IgH C regions are of endogenous origin is that regions toward the 3′ end of the IgH locus are known to play a major role in achieving efficient Ig class switch recombination as well, probably as optimal IgV gene somatic hypermutation (19, 51, 52). There are substantial differences between mouse/rat and human in the sequences in this enhancer region of the IgH locus, located some 30 kb downstream of Cα (53). The use of endogenous rat sequences for this region of the OmniRat IgH locus may well contribute to the efficient performance in Ab class switching and affinity maturation displayed by this rat strain. The creation of OmniRat was assisted by several technical aspects. The strategy of combining YAC and BAC technologies allowed the suitability of yeast to be exploited for the faithful engineering of large loci containing multiple repeats, and the use of E. coli allowed the production of high DNA yields, which aided locus characterization as well as oocyte microinjection. This circumvented both the often problematic engineering of large transloci that harbor multiple repeat sequences in E. coli and obtaining high concentrations of translocus DNA, which is not readily accomplished from yeast. The assembling of the transgenic IgH locus in the rat genome was also facilitated by the finding that different DNA constructs carrying distinct parts of the IgH locus can cointegrate at a single site of genomic integration, thereby allowing a large translocus to be recreated by cointegration of smaller sections. Overlapping integration has been reported previously, but for much smaller regions (<100 kb) (29, 54). Our results in this study suggest that cointegration of simultaneously injected constructs, probably by homology but possibly in tandem, is quite a frequent event. This is very helpful because there is a limit to the size of individual DNA molecules that can be manipulated in vitro and microinjected into eggs without risk of shearing. The usual alternative strategy for generating animals containing very large transloci would be via integration of YACs into stem cells and subsequent animal derivation (39, 55); this can prove quite laborious, especially in animals such as rats where there is limited experience with stem cell technology. A further major aspect of the technical strategy that had facilitated the creation of OmniRat was the use of ZFN technology in fertilized rat oocytes to inactive the endogenous rat Ig loci (35, 42). Because there is no established method for targeted gene recombination in rat embryonic stem cells, we had to devise a strategy distinct from that which has been previously used for target gene inactivation in the mouse. However, the ready success of this application of ZFN technology in rat eggs suggests that this may well be the future technology of choice for gene disruptions and replacement. The diverse high expression of the transgenic Ig loci in OmniRat is further demonstrated in rats in which an endogenous Ig locus was intact and good titers of Ag-specific human Ig as well as hybridomas expressing high-affinity human mAbs could be obtained following immunization. Thus, in these rats containing a chimeric human/rat IgH locus together with human IgL translocus, the transloci compete very effectively in terms of performance with the endogenous rat Ig loci. A comparison of immunization results, based on Ag-binding and isotype (see Tables III, IV), would make it near impossible to identify whether the results were obtained from normal wt rats or from OmniRat. This appears to be very different from the selected transgenic human Ab results made available and from the experience we had respective to the relative performance of the transloci and endogenous loci in mice carrying fully human IgH transloci (15, 19, 55). Following fusions of spleen and lymph node cells, OmniRat yielded a range of specific IgG Abs in response to immunization with a variety of Ags. These Abs displayed a diversity in epitope recognition comparable to that obtained using wt control rats. The molecular diversity of the Abs produced was considerable, with contributions as anticipated (44) from nearly all the V, D, and J gene sequences on the transloci segments. This was in stark contrast to some mice carrying fully human transloci where selective clonal expansion of relatively few precursor B cells was found to yield only limited molecular diversity (19, 55). Thus, for example, five-feature mice expressing fully human Ab repertoires showed a substantial reduction in the frequency of IgM+ B cells in the bone marrow from the pre–B-cell stage onward: frequencies were 21% of those observed in wt mice (56). The five-feature mice also showed a substantial reduction of splenic IgM+ B cells (∼35% of controls) (17). Furthermore, although the extent of this reduction was variable, the frequency of splenic IgM+ B cells in the humanized five-feature mice was always less than that in controls, whereas OmniRat consistently gave the same frequency of splenic IgM+ cells as observed in wt animals. The fact that the number of transplanted V genes in OmniRat is only about half of those present in humans does not appear to have led to any significant restriction in the diversity of the immune response. Comparison of the CDR3 diversity in >1000 B cell clones (sequences can be provided) revealed the same extensive junctional differences in OmniRat animals as observed in wt control rats. When identical combinations of V, D, and J segments were very occasionally observed, differences between these sequences due to either N sequence addition/deletion or hypermutation were nevertheless observed. Extensive diversity was also seen for the introduced human Igκ and Igλ loci, similar to what has previously been observed with mice transgenic for human Ig loci (17, 19, 24). Hence, the compromised efficiency in the production of human Abs observed with mice carrying fully human Ig transloci (13) has been overcome in OmniRat: these rats generate enormous diversity of V(D)J gene rearrangements from their transloci with efficient subsequent somatic hypermutation and class switching, leading to the production of high-affinity IgG Abs as a matter of routine. The yield of transgenic serum IgG and the level of IgV gene somatic hypermutation observed in the Ag-specific mAbs obtained from the OmniRat strain revealed that clonal diversification and levels of serum Ab production were similar in OmniRat and control animals. Routine generation of high-affinity specificities in the subnanomolar range was accomplished by different single immunizations and compared favorably with wt animals. In summary, this reveals that to maximize human Ab production, the best approach is to use an IgH locus with human V(D)J gene segments, so as to yield human Ag-specific binding sites, but rodent C genes and control sequences to ensure efficient B cell differentiation, high Ab expression, and diversification. For therapeutic applications, the rat CH regions in mAbs obtained from OmniRat can readily be replaced by human CH regions without compromising Ag-specificity during the bulking up phase of mAb production. We acknowledge that some microinjections for the generation of transgenic rats were performed at the Taconic Farms, Inc. facility located in Cranbury, NJ. Breeding and genotyping of the Open Monoclonal Technology, Inc. OmniRat strain were performed at Charles River Laboratories (Wilmington, MA), and FISH analysis was carried out by Cell Line Genetics (Madison, WI). We are grateful to G. Davis for critical discussion and comments on the manuscript. ↵2 R.B. and M.B. contributed jointly to experimental design and execution. This work was supported by Open Monoclonal Technology, Inc., Biogenouest, and Région Pays de la Loire, France.
. 2010. Therapeutic antibodies for autoimmunity and inflammation. Nat. Rev. Immunol. 10: 301–316.
. 2009. Next generation immunotherapeutics—honing the magic bullet. Curr. Opin. Biotechnol. 20: 405–411.
. 2011. A neutralizing antibody selected from plasma cells that binds to group 1 and group 2 influenza A hemagglutinins. Science 333: 850–856.
. 2011. Memory B cell antibodies to HIV-1 gp140 cloned from individuals infected with clade A and B viruses. PLoS ONE 6: e24078.
. 2010. Generation of human antigen-specific monoclonal IgM antibodies using vaccinated “human immune system” mice. PLoS ONE 5: e13137.
. 1988. Reshaping human antibodies for therapy. Nature 332: 323–327.
. 1988. Novel antibodies by DNA manipulation. Prog. Allergy 45: 91–105.
. 1989. The immunogenicity of chimeric antibodies. J. Exp. Med. 170: 2153–2157.
. 2007. Part I: Selecting and shaping the antibody molecule, selection strategies III: transgenic mice. In Handbook of Therapeutic Antibodies. Dübel S., ed. Wiley-VCH Verlag, Weinheim, Germany. p. 69–93. 1999. Antibody engineering via genetic engineering of the mouse: XenoMouse strains are a vehicle for the facile generation of therapeutic human monoclonal antibodies. J. Immunol. Methods 231: 11–23.
. 2002. Production of human monoclonal and polyclonal antibodies in TransChromo animals. Cloning Stem Cells 4: 91–102.
. 2002. Cloned transchromosomic calves producing human immunoglobulin. Nat. Biotechnol. 20: 889–894. 2005. Human antibodies from transgenic animals. Nat. Biotechnol. 23: 1117–1125. 2008. Fully human antibodies from transgenic mouse and phage display platforms. Curr. Opin. Immunol. 20: 450–459.
. 1989. A repertoire of monoclonal antibodies with human heavy chains from transgenic mice. Proc. Natl. Acad. Sci. USA 86: 6709–6713.
. 1994. Antigen-specific human antibodies from mice comprising four distinct genetic modifications. Nature 368: 856–859.
. 1999. Antibody repertoires of four- and five-feature translocus mice carrying human immunoglobulin heavy chain and κ and λ light chain yeast artificial chromosomes. J. Immunol. 163: 6898–6906.
. 1991. A B cell-deficient mouse by targeted disruption of the membrane exon of the immunoglobulin μ chain gene. Nature 350: 423–426.
. 2011. Human monoclonal antibodies to HIV-1 gp140 from mice bearing YAC-based human immunoglobulin transloci. Protein Eng. Des. Sel. 24: 791–799.
. 1988. pYAC-RC, a yeast artificial chromosome vector for cloning DNA cut with infrequently cutting restriction endonucleases. Nucleic Acids Res. 16: 7743.
. 2007. A family of glycosylphosphatidylinositol-linked aspartyl proteases is required for virulence of Candida glabrata. Proc. Natl. Acad. Sci. USA 104: 7628–7633.
. 1994. YAC Libraries: A User’s Guide. Freeman and Company, New York.
. 1996. Assembly and extension of yeast artificial chromosomes to build up a large locus. Gene 177: 195–201.
. 1999. A human immunoglobulin λ locus is similarly well expressed in mice and humans. J. Exp. Med. 189: 1611–1620.
. 1998. Transformation of yeast by the lithium acetate single-stranded carrier DNA/PEG method. Methods Microbiol. 26: 53–66. 2007. Preparation of intact yeast artificial chromosome DNA for transgenesis of mice. Nat. Protoc. 2: 3009–3015. 1988. Characterization of the “unusual” mobility of large circular DNAs in pulsed field-gradient electrophoresis. Nucleic Acids Res. 16: 925–939.
. 2001. Evolutionary dynamics of the human immunoglobulin kappa locus and the germline repertoire of the Vκ genes. Eur. J. Immunol. 31: 1017–1028.
. 1996. Antibody expression from the core region of the human IgH locus reconstructed in transgenic mice using bacteriophage P1 clones. Genomics 35: 405–414.
. 2001. Molecular Cloning. A Laboratory Manual. Cold Spring Harbor Laboratory Press, New York.
. 1992. Recovery of DNA from agarose gels using a modified Elutrap. J. Biochem. Biophys. Methods 24: 45–50.
. 1996. Human antibody repertoires in transgenic mice: manipulation and transfer of YACs. In Antibody Engineering: A Practical Approach. McCafferty J., H. R. Hoogenboom, D. J. Chiswell, eds. IRL, Oxford, U.K., p. 59–76.
. 1997. Homologous recombination based modification in Escherichia coli and germline transmission in transgenic mice of a bacterial artificial chromosome. Nat. Biotechnol. 15: 859–865.
. 1989. A matched set of rat/mouse chimeric antibodies. Identification and biological properties of rat H chain constant regions μ, γ1, γ2a, γ2b, γ2c, ε, and α. J. Immunol. 142: 3145–3150.
. 2010. Characterization of immunoglobulin heavy chain knockout rats. Eur. J. Immunol. 40: 2932–2941.
. 2008. Protocols for cytogenetic studies of human embryonic stem cells. Methods 45: 133–141.
. 1995. A novel method of preparing rat-monoclonal antibody-producing hybridomas by using rat medial iliac lymph node cells. Cell Struct. Funct. 20: 151–156.
. 1992. Targeted alterations in yeast artificial chromosomes for inter-species gene transfer. Nucleic Acids Res. 20: 2693–2698.
. 1993. Creation of mice expressing human antibody light chains by introduction of a yeast artificial chromosome containing the core region of the human immunoglobulin κ locus. Biotechnology (N. Y.) 11: 911–914.
. 2001. Novel control motif cluster in the IgH δ-γ3 interval exhibits B cell-specific enhancer function in early development. J. Immunol. 166: 3315–3323.
. 1993. Transgenic mice containing a human heavy chain immunoglobulin gene fragment cloned in a yeast artificial chromosome. Nat. Genet. 4: 117–123.
. 2009. Knockout rats via embryo microinjection of zinc-finger nucleases. Science 325: 433.
. 2011. Efficient immunoglobulin gene disruption and targeted replacement in rabbit using zinc finger nucleases. PLoS ONE 6: e21045.
. 2001. The Immunoglobulin FactsBook. Academic Press, London, p. 45–68.
. 2005. Interallelic class switch recombination contributes significantly to class switching in mouse B cells. J. Immunol. 174: 6176–6183.
. 1974. Three classes and four (sub)classes of rat immunoglobulins: IgM, IgA, IgE and IgG1, IgG2a, IgG2b, IgG2c. Eur. J. Immunol. 4: 44–48.
. 1975. Rat immunoglobulins in serum and secretions: purification of rat IgM, IgA and IgG and their quantitation in serum, colostrum, milk and saliva. Immunochemistry 12: 817–823.
. 1994. Serum immunoglobulin G subclass concentrations in periodontally healthy and diseased individuals. Infect. Immun. 62: 1677–1682.
. 2007. Fc-receptors as regulators of immunity. Adv. Immunol. 96: 179–204.
. 2012. Antigen and cytokine receptor signals guide the development of the naïve mature B cell repertoire. Immunol. Res. In press.
. 2001. Localization of the 3′ IgH locus elements that effect long-distance regulation of class switch recombination. Immunity 15: 187–199.
. 2007. Transcription of a productively rearranged Ig VDJCα does not require the presence of HS4 in the IgH 3′ regulatory region. J. Immunol. 178: 6297–6306.
. 1991. The mouse IgH 3′-enhancer. Eur. J. Immunol. 21: 1499–1504.
. 1991. Human antibody production in transgenic mice: expression from 100 kb of the human IgH locus. Eur. J. Immunol. 21: 1323–1326.
. 1997. Functional transplant of megabase human immunoglobulin loci recapitulates human antibody response in mice. Nat. Genet. 15: 146–156. 2004. Human monoclonal antibodies from translocus mice. In Molecular Biology of B Cells. Honjo T., M. S. Neuberger, eds. Academic Press, New York, p. 547–561.